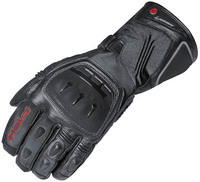 The Twin Gore-Tex 2-in-1 gloves offer a unique design that can be a fully insulated glove or a glove with less insulation between your palm and the controls. It has a unique 2 compartment design. It is both warm and waterproof. The main draw here is the unique two chamber design of the glove. If you take the “View Larger Images” link above you’ll see a couple good shots of this. There is an inner divider built into the glove and you can choose which “chamber” to put your hand in. If you put your hand into the “Dry” chamber your hand is surrounded by Gore-Tex and the palm of your hand is on the glove’s palm leather with no insulation in between. If you put your hand in the “Warm” chamber, you are still surrounded by Gore-Tex and now you have insulation on the backside AND the front side of your hand. So that is the “magic” of this design. For colder and/or wet weather, you can choose to have insulation all around just like most dedicated/insulated gloves, but when it is not as cold out and/or if you have heated grips, you can choose to wear the glove with insulation only on the backside of your hand and with no insulation on the palm side. In this position, you’ll have improved feel for the controls and less insulation to prevent the flow of heat into your hands from heated grips. Held says: The Held Twin Gore-Tex 2-in-1 gloves feature dual-chamber technology for your choice of two compartments – the “warm chamber” provides an extra layer of insulation while the “dry chamber” allows better tactile feel and optimal grip.